Leah Gold and her daughter, Ali,below. 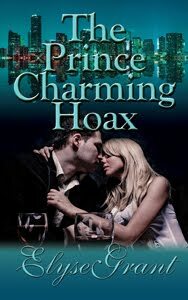 One of my favorite scenes in THE PRINCE CHARMING HOAX comes early in the story, in chapter 4. I think it really captures the good mother-daughter relationship, which is a foundation of the book. Ali, has just come from shopping for her prom dress. Let's join them. Ali, Dana, and Tori spilled out of Dana’s Civic. Leah watched as the girls hugged each other good-bye while Ali retrieved her packages from the trunk. Laughing and all talking at the same time, they were the perfect image of what life should be like at their age with prom and high-school graduation approaching. Ali waved good-bye to her friends and walked toward the house. “Sorry. I’ll clean it up before I go to work,” Ali gave Leah a peck on the cheek and quickly headed upstairs, arms full of shopping bags. Leah tore the top sheet off the pad, ripped it up, and threw it in the trash. She was not going to spoil Ali’s joy today. She began to do the dishes as she waited for Ali to come out and show off her finery. Leah ran into the living room and looked up to the top of the spiral stairway. She knew Ali loved to make a dramatic entrance, but she was totally unprepared for what she saw. Her daughter stood on the top step, enveloped by the sun streaming in from the two skylights above the staircase, as if in a spotlight. Ali had chosen a classic-style gown in white crepe knit with one shoulder strap, a diagonal neckline and slit up the side. Ethereal as Aphrodite, she glided down the steps and rotated at the foot of the stairs, so Leah could see her back. The dress draped down gracefully to her waistline, exposing her back. Ali wasn’t wearing anything under the dress and didn’t need to. She filled every curve of the design perfectly. Ali had tried to contain her massive golden mane in rhinestone clips, but some of the long heavy curls escaped, framing her face and falling down her shoulders and back. “Don’t you like it, Mommy? You’re not saying anything.” She searched Leah’s face for an answer. “Mom, you’re crying,” Ali said, and she rushed over to hug Leah. Ali’s phone rang and she hiked up the dress as she raced upstairs to answer. Leah smiled. So much for grace and beauty, she thought. Leah’s humor turned into concern when she heard Ali screaming. She ran upstairs to find her daughter sitting on the bed, tears streaming down her face. “Oh no. Sweetie, maybe he could apologize to the coach and the principal. There must be something he can do.” Leah sat next to Ali and stroked her hair. Ali rested her head on Leah’s shoulder, wiping her eyes and nose with a tissue. Leah felt her defensive maternal instinct flaring. If Justin were there, she would have strangled the little twerp. Leah nodded. She knew Justin’s parents loved Ali and probably wanted to strangle him, too. “Mommy, why do guys do stuff like that?” Ali asked as she slipped off her dress. “I know, it could be Doug,” Ali teased. The last thing Leah wanted to do right now was talk about moving to New York. And Jonathan would gloat if he knew the truth. He had warned her about getting involved with Doug from the very beginning. She had brushed off his admonitions, thinking he wanted a chance with her himself. Leah heard Ali’s phone ring across the hall and hoped it was good news. Leah was startled with her daughter’s comeback. Did Ali really think she’d learned that attitude from her? Leah’s phone, still in her hand, rang. It was Doug’s name on the call screen this time. Leah decided to let voice mail pick up. “No one important.” Leah walked back into her bedroom and replaced the phone on the charger cradle next to a framed photo of her and Doug taken in front of the Eiffel Tower.